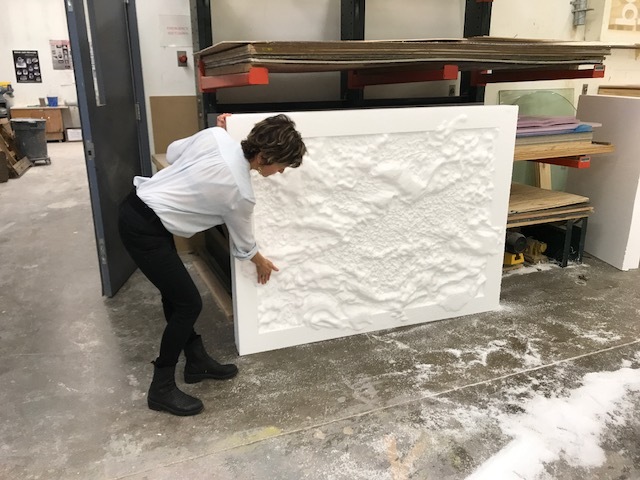 Naomie Kremer with a carving she made based on her painting Axis Mundi, during her residency at PAC. Naomie Kremer is a visiting artist doing a micro residency at WPU. She’s working with graduate student James Brehm on projects and research using Cinema 4D software, and a CNC Gantry Mill machine. This fall, Professor Michael Rees invited Kremer to come see how WP’s high-tech equipment at the Power Art Center fuses together with art. Kremer was interested in what goes on at the Power Art Center so Professor Rees asked her to submit a proposal for the micro residency. Kremer said that Brehm is guiding her and showing her the “ins and outs” of the programs and how to use the Cinema 4D software, a 3D modeling, animation, motion graphic and rendering application and the CNC Gantry Mill. Naomie Kremer is a painter and multi-media artist. 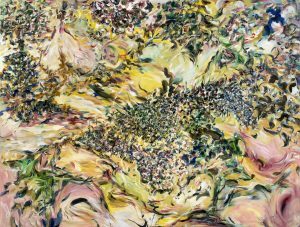 Her paintings are in many public and private collections including the Fine Arts Museums of San Francisco, the Whitney Museum, the Magnes Museum, the University of California Berkeley Art Museum and the US Embassy in Beijing, China. She’s had solo exhibitions in San Francisco, New York, Los Angeles, New Orleans, Houston, Paris and Dusseldorf. Her painting animations have been featured on the Apple Pro website for their unusual use of the animation program Motion, animating hundreds of layers of brushstrokes she selects from her paintings using Photoshop. The end results are amazing. Imagine looking at a painting and all of a sudden hundreds of brush strokes begin to move and dance throughout the canvas. Her video based work also includes set design, text animation, and painting animations. Her video set designs include the recent production of Alcina, by George Frederick Handel, in Acre, Israel in September 2016; the world premiere opera The Secret Garden, commissioned by the San Francisco Opera; Light Moves, a collaboration with Margaret Jenkins Dance Company that was performed at Yerba Buena Center for the Arts, Clarice Smith Center for the Performing Arts at the University of Maryland, and the Dance Center at Columbia College in Chicago; and Bluebeard’s Castle by Bela Bartok commissioned by the Berkeley Opera. She is currently collaborating with a documentary filmmaker David Grubin on a film about Genesis, the first book of the Bible. On April 3, Kremer gave a lecture at the Power Art Center. She showed several clips of videos that demonstrated the different styles and techniques she uses in making art. She also showed a video of a drawing class she taught at the Pont Aven School of Contemporary Art in Brittany, France. It showed drawing to the rhythmic beat of a live drummer, under Kremer’s instruction to follow the beat strictly, using the drawing tool almost like a drumstick. She also showed videos of her work in set designs for dance and opera. Her work gave these performances very unique moving and changing scenery. Kremer shared some advice for artists at WPU, “The most important thing is to persist, keep going, keep working. Work to please yourself and follow your own drives and interests. Don’t try to contrive something that you think is going to sell. The art market is so strange. The art world doesn’t function like any other business, because no one actually needs to buy art or to own it,” said Kremer. Kremer was born in Tel Aviv, Israel and raised in Brooklyn, NY. She has lived in the Bay Area since 1977. She received her MFA in Painting and Drawing from California College of the Arts in 1993, and has taught painting and drawing at both the graduate and undergraduate levels at the San Francisco Art Institute, California College of the Arts, California State University Hayward and the Pont Aven School of Contemporary Art in Brittany, France. She is represented in San Francisco by Modernism Gallery; in New Orleans and Houston by Octavia Gallery; in Aspen, Colorado by 212 Gallery; and in Dusseldorf, Germany by Von Fraunberg Gallery. Visit www.naomiekremer.com to see more of her work.